The introduction of widgets to iOS allows you to customize Safari with various time-saving apps, such as adding Pinterest to the sharing options or 1Password to the custom activities you can perform within Safari. This really allows you to personalize your iPad and get the most out of browsing the web without the need to jump through hoops to share images and web pages to your friends. Before you can install the widget into Safari, you'll first need to download the app from the App Store. Most widgets are a part of the official app, which allows special access when called from Safari or another app. A few widgets don't do anything when running stand-alone mode and must be run from within another app. First, open the Safari browser. You don't need to browse to a specific page, but you do need to have a web page loaded in a browser tab. Next, tap the Share button. It is the button to the left of the plus button at the top of the display. It looks like a box with an arrow pointing up. 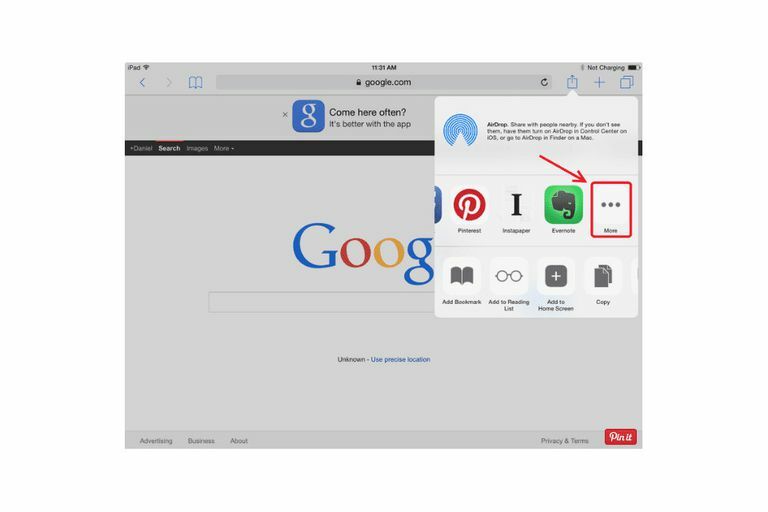 If you are installing Pinterest, Instapaper, Evernote or other social sharing widgets, you will need to tap the More button in the Share section. This is the section with Mail, Twitter, and Facebook. Swipe from right to left to reveal more app icons until the More button with the three dots appears. For 1Password and other non-sharing activities, you will follow the same basic directions, except instead of tapping the More button from the Sharing section, you will need to tap it from the Activities section. This section starts with the Add Bookmark button. If you are unsure of which to choose, start with the bar of icons starting with Mail, Twitter, and Facebook. When you tap the More button, a new window will appear that lists the available icons. If you don't see your widget, be sure to scroll down to the bottom of this new window. All available widgets will show up on this list, and you can turn on individual widgets by tapping the on/off slider. Widgets that are active will have a green slider next to them. After the widget is installed, it will show up in the bar of icons in the sharing window. Newly added widgets will appear just before the More button. To use the widget, simply tap the newly installed button. Fun fact: You can reorder your widgets from within the same screen you add them. If you tap and hold your finger on the three horizontal bars to the right of the on/off slider, you can drag the widget to a new location in the list. So if you rarely Mail a bookmark to someone, but often Pin a web page, you can move Pinterest to the top of the list.